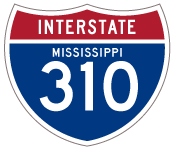 Designated as Mississippi 601, Interstate 310 was the proposed Canal Road – Port Connector in Gulfport.4 It was planned to begin at a new interchange with Interstate 10 and the south end of the proposed U.S. 49 Gulfport to Hattiesburg freeway (Mississippi 601 North). South from there, I-310 would have extended south across U.S. 90 at 27th Avenue into the Port of Gulfport. 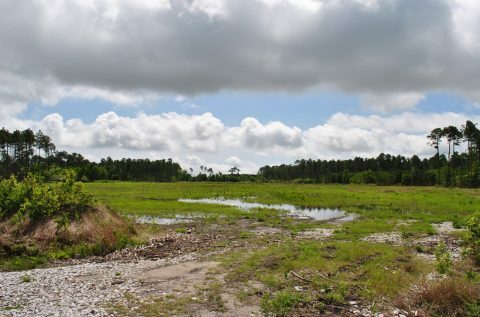 Land clearing was completed along a swath of right of way reserved for the Central Harrison Connector in 2011. This view looks south from South Boulevard near Gulfport Dragway. Photo taken April 5, 2012. 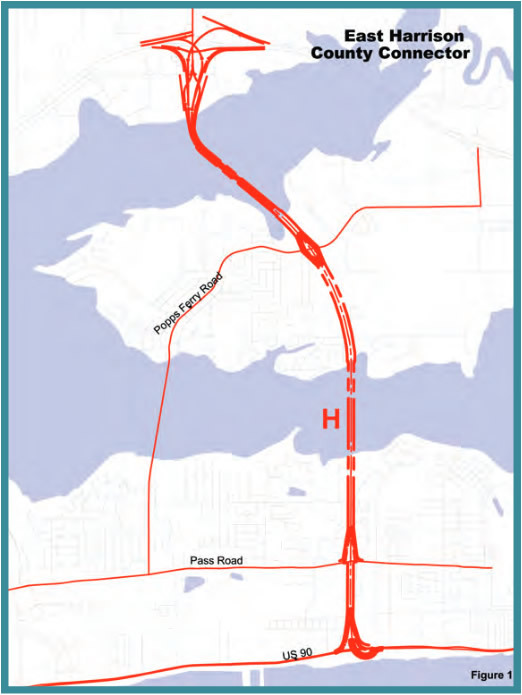 The projected path of MS 601 took the Central Harrison Connector south from near the interchange joining I-10 with Canal Road to 30th Avenue in Gulfport. The project would have likely included a temporary access road linking the freeway with Canal Road until funding was made available for the systems exchange with MS 601 north and I-10. “Road plan for Biloxi in design stages.” The Clarion-Ledger (Jackson, MS), August 1, 2005. “Elevated route from I-10 to port will divide city, Gulfport Mayor tells MDOT panel,” by Laura Hipp, The Clarion-Ledger (Jackson, MS), April 12, 2006. “Road projects in progress: Route would link Biloxi to I-10.” Sun-Herald (Biloxi, MS), December 17, 2006. 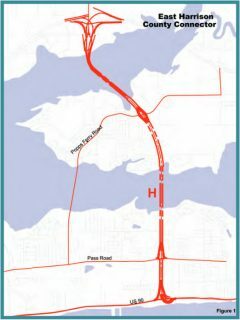 Central Harrison County Connector Highway fact sheet. Mississippi Department of Transportation (MDOT). “MDOT has spent $158.5 million on road never built.” Sun-Herald (Biloxi, MS), July 15, 2016. “New connector highway on hold.” Sun-Herald (Biloxi, MS), December 14, 2006. Page updated Seotember 4, 2016.